As a young Tunisian feminist living in the UK, I am often tempted to ask non-Tunisians what they know about Tunisian women. The answers usually range from ‘I don’t really know’ to ‘modern, liberated women enjoying a privileged status’. It is the second answer that I find most challenging; it makes me realize how efficient the Tunisian state’s propaganda machine has been over the decades. This is most manifest in the rosy picture projected to the world about the enviable ‘status’ of Tunisian women, especially in comparison to the situation of women in other Arab-Muslim countries. The popular myth of the freedom and equality enjoyed by Tunisian women is quickly debunked when one considers a 2011 national survey which reports that 47.6% of Tunisian women aged between 18 and 64 have suffered at least one form violence, whether sexual, physical, emotional or economic. In 78.2% of the cases it is the woman’s sexual partner who is responsible for this violence. Under the current government, women can get raped by policemen and still be accused of and tried for offending norms of public decency, as was the case in October this year with a young woman called Maryem, who was 25 years old at the time of her attack. Sadly, the current degradation of women’s rights in Tunisia appears to be a case of history – or her-story to use a feminist alternative - repeating itself; it is the latest and most disturbing manifestation of decades of repression of women’s movements under the guise of state feminism. State feminism is essentially the systematic and explicit governmental exploitation of the feminist cause for political reasons narrowly linked to enhancing the image, prestige and ideological sustainability of the autocratic regime. The ‘feminist’ state takes on the championing of women’s rights and promotion of gender equality via legislative and executive mechanisms. In this context it is supposed that there is no need for a feminist movement to exist in opposition to the state and where feminist movements do exist they must act in accordance with the state’s political priorities. Since Tunisia gained independence from France in 1956, the situation of women in Tunisia has indeed been better than elsewhere in the Arab-Muslim world at the level of legislation. This is a well cited fact, and one that helps to sustain the image of a feminist Tunisia. One of the first pioneering pieces of legislation, The Code of Personal Status (CPS) was passed by the first president of the Tunisian republic, Habib Bourguiba, on 13 August 1956. It was sympathetic to the spirit of feminist egalitarianism and gave women some essential rights. However, the CPS instituted a cycle of top-down reform and many feminist historians argue that it was the legacy of a post-colonial government having to prove its modernity. It worked. President Bourguiba was declared the ‘liberator of Tunisian women’. Yet Bourguiba failed to ensure economic autonomy for women - for example in relation to inheritance - and continued the long-lasting dependency of women on male heads of households and, significantly, on him as leader. This initiated a culture of political patriarchy. At that period of time, any official discourse about women necessarily meant women affiliated to the Neo-Destour party headed by Bourguiba. By effectively outlawing other forms of political leadership, Bourguiba stalled the women’s movement in its broader fight for autonomy from male authority. The few feminist movements with leftist allegiance that emerged such as the Tahar Haddad Club: Club of Women’s Conditions Studies (CECF), the Women’s Union Commission and the Tunisian Association of Democratic Women (ATFD), were considered misguided rivals to the state-sponsored movement UNFT (The National Union of Tunisian Women) - the ‘social wing’ of the ruling party. This oppression of alternative women’s movements continued under Ben Ali’s regime. Again, women’s status was made to serve as a signifier for modernity and also to bring into sharp relief the contrast of the incumbent regime vis-à-vis the then rising Islamist movement. The UNFT continued to be the government’s social wing. State-sponsored women’s organizations, namely the Tunisian Association of Mothers (ATM) founded by Saida Agrebi, a member of the central committee of the ruling party RCD, were depicted as the representatives of all Tunisian women. Meanwhile, Leila Ben Ali, Tunisia’s ‘first lady’, was presented to the world as the model Tunisian independent woman. In 1989 several new women’s movements emerged onstage and were tolerated on the basis of an understanding that they would be working in line with, and in support of, the ruling party leadership. Any mention of discrimination of any kind was regarded as unjustified rebellion and disturbance of the status quo. Much to the regime’s surprise, some independent feminist activists started working hard to spread alternative and oppositional messages about their rights as codified in law, highlighting the gap between rights on paper and their enforcement on the ground. The women who stood out from the crowd of yes-sayers were to pay a heavy price under the Ben Ali regime. Radhia Nasraoui, lawyer and human rights activist, Maya Jribi, now Secretary General of the Democratic Progressive Party (PDP) and Sihem Ben Sedrin, a human rights activist were, among other women activists, subjected to atrocious forms of oppression. These activists who chose to be independent from the government were classified a ‘national’ threat; the regime sought to make them invisible domestically and internationally and even threatened them with fake pornographic videos. These very same women activists are today subject to the same forms of violence and oppression under the new Islamist government. Being secular, they are portrayed as ‘non-believers’; westernized women trying to impose western values on Tunisian women, and thus undermine their religious and cultural traditions. The political space of opposition remains extremely limited in post-revolutionary Tunisia, meanwhile even the legislative situation is under attack. In all of these ways we are seeing a shift in the form state feminism takes under the new Islamist government towards a more explicit anti-women’s rights agenda. In the Tunisian revolution which took place from December 2010 to January 2011, women participated in street demonstrations, strikes and sit-ins and acted as spokeswomen through available media. Along with men, women were at the receiving end of police atrocities. In Kasserine, one of the leading governorates in the revolutions, there are well-corroborated testimonies of women having been raped by policemen. In the shifting political landscape that followed the Tunisian revolution, voices speaking up for women’s rights became momentarily louder. The major demand of different feminist organizations was to update the CPS fifty years on from its initial promulgation. Tunisians began to worry about the acquisitions that women had secured in law since Independence when Rached Ghannouchi, the leader of Nahdha, the Islamist party which won the majority of votes in the Constituent National Assembly elections in October 2011, suggested holding a referendum about the CPS to reconsider the clauses that he believed were in contradiction with Islam – mainly the prohibition of polygamy and the right to adoption. In an effort to discredit women’s rights construed as being in opposition with Islamic law, one of the party’s female members, Souad Abderrahim, similarly gave an impassioned tirade against liberal secular feminists for calling for measures to protect and support single mothers. A conference held in Tunis in March this year on the initiative of ‘Equality and Parity’ and ‘Tunisia is my Trust’ (Tounis Amenaty) was devoted to debating possible action to have women’s rights protected, improved and constitutionalised. Hadjar Azayez, a National Constituent Assembly member for the Nahdha, was among the panellists. Azayez reassured the conference participants that her party would not revise the CPS. This was not applauded by the attendees, first because it implied the government’s unwillingness to improve the code and bring it up to date, and secondly because it implied that Nahdha reserves the right to decide on women’s rights. Feminists’ efforts to ensure a space for an independent women’s movement that can play a role in decisions on women’s issues are not on the cards under this regime. Meanwhile, the Islamists’ trump card remains the religious and cultural identity of the country. Nhadha supporters, mainly on Facebook, have spared no efforts in their well-organized smear campaign against feminists, especially the secular feminists and ATFD members. Saaida Garrach and Bochra Bel Hadj Hmida, lawyers and feminist activists, and Najiba Hamrouni, journalist and the head of the journalists union, have been among the most targeted. The attacks on women’s rights advocates is taking new forms designed to undermine their legitimacy in an eerie echo of previous regimes; caricatures and cruel videos have been widely shared by Nahdha supporters, portraying these women as enemies of the Muslim society and as agents of Western agendas. Like the legislative framework, the political process is seeing new challenges to equality under the post-revolutionary regime. During elections, parity within the electoral lists was set as a condition. Participating parties had to include as many women as men in their lists, but not necessarily as heads of lists. Women who participated in elections and who worked hard during campaigns reported being subjected to verbal violence and harassment. In the documentary ‘Women of My Country, Women to Reckon With’, Samira Belkadhy, a member of the Tunisian Labour Party, tells the story of how some men reacted when she approached them to represent her party: some started yelling and inciting violence against her, quoting what was said to be a hadith (Prophet Mohamed’s reported sayings) to the effect that no nation headed by a woman would witness well-being and prosperity. It is unsurprising that currently just a quarter of National Constituent Assembly members are women. Furthermore, it seems then that the majority of women in the National Constituent Assembly do not represent women, but rather the parties they are part of and, more specifically, their senior male leadership. As under Bourguiba and Ben Ali, the political leadership is promoting women in order to enlist their votes and seek wider acceptance. The presence of women on Nahdha’s electoral list in particular has helped to convince people that, against all established perceptions and its proven track record, the Islamist party is ‘women-friendly’ and believes in women’s ability and eligibility to lead and act in all fields. Once again, the supposed political enfranchisement of women has been used as a progressive front. 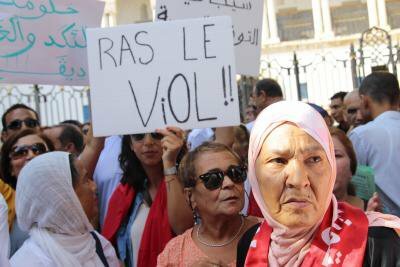 The long history of the instrumentalisation of women for political reasons has made many Tunisians aware of the real incentives behind the Islamist party’s promotion of women. In fact, the party’s real attitude towards women was made clear in its suggestion of reform to article 28 of the constitution, identifying women as ‘complimentary’ to men. This decision was protested by thousands of Tunisians on 13 August 2012, Tunisian women’s day. In Tunisia today, women continue to endure sexist oppression on a daily basis under the paternal roof of a state that claims to be at the forefront of championing the feminist cause. As a new form of Islamist state feminism is forged we are seeing a historic cycle head towards a tragic denouement, the further shrinking of political space and unprecedented threats to women’s most fundamental rights. In this context we need to strengthen the capacity of feminist movements outside the establishment. The Tunisian experience with state feminism is a model to draw lessons from, especially for the Arab-Muslim countries whether governed by liberal autocratic regimes or Islamist regimes: whenever the regime talks in favour of women, read between the lines.